The supply chain is a complex mix of activities that is focused on cost effectively delivering products and/or services. Many people associate the supply chain with manufacturing and distribution companies but every manufacturing consulting company is in business to provide a product or service to its customers. A supply chain is like breathing. When it is running well it isn’t noticed, but when it goes awry, the whole business suffers. Group50’s supply chain consultants have managed supply chains of all sizes ($20M – $4B) and we use the same methodologies are assessing effectiveness. Companies need to be effective at designing products, defining services, forecasting, acquiring materials and resources, purchasing and delivering those products and services to their customers. 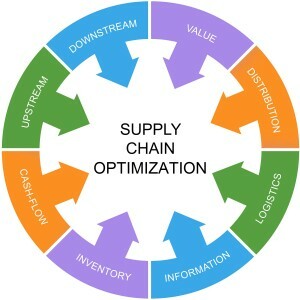 And, they need to do it with lower cost year in and year out Supply Chain Optimization is achieved by focusing on the key elements shown in the diagram to the right. Optimization occurs when all of the elements are driving increased profits, minimal working capital and shorter lead times. In order to optimize a supply chain, it is important to understand the existing strategic and operating gaps in your company, your vendors and your customers. Group50 supply chain consultants provide strategic sourcing services and have designed and implemented optimized supply chains in many industries as a result of the experience and knowledge of best practices and an integrated approach to designing and implementing an optimization roadmap. The first step is to understand how well your supply chain is doing through our Supply Chain Effectiveness Assessment or our Distribution Assessment. From there, we will work with the senior leadership team to develop an optimization roadmap and implement a continuous improvement program that will generate 5-10% cost improvements, reduced working capital requirements and reduced lead times year over year. You can find our more about Group50’s Supply Chain Optimization program by calling (909) 949-9083, sending a note to info@group50.com or requesting more information here.